Buffalo, like many other cities in America, was a once booming city of industry in the late 19th and early 20th century. It was a manufacturing powerhouse, located squarely at the western end of the Erie Canal. Cars, consumer goods, railroad cars, steel, grain storage, were some of the major industries here. Grand theatres, office buildings, and homes sprung up to accommodate the growing middle class. At one point, it even rivaled New York City as one of the wealthiest cities in the United States. Beautiful buildings and parks proliferated all over the city, from such names as Frank Lloyd Wright, Louis Sullivan, and Frederick Law Olmsted. However, after the Depression, industries went out of business and never regenerated. People fled to the suburbs, or to other cities. Currently, Buffalo is a city estimated to have 268,900 residents, of which this number is declining. Approximately 10,000 houses lay empty. With empty houses comes a number of issues, including blight, crime, vandalism, and a reduction in community. 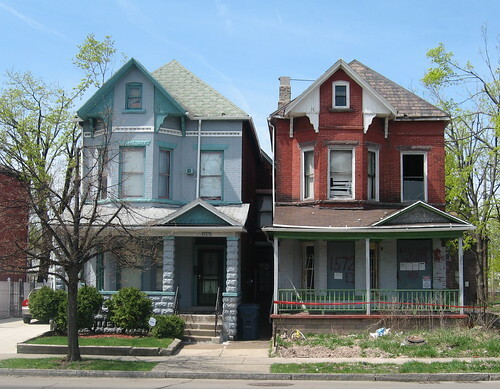 The city has plans to demolish 5,000 houses in the next couple of years. Simply demolishing these houses and putting the rubble into a landfill seems to be the easy and quick short term solution. However, what about the most efficient long term solution? This is where deconstruction comes in. “Deconstruction, or ‘green demolition’, is the process of taking down a building in the opposite way it was assembled, so that as much of the building material can be salvaged and reused. We use a 10,000 pound all-terrain forklift, to complement human labour, and it has proven to be a more efficient, cost-effective, and economically practical approach than hand deconstruction,” describes Rachel Matthews, Volunteer Coordinator at Buffalo ReUse, a not-for-profit social enterprise in Buffalo, New York. From a materials perspective, the process of demolition by Buffalo ReUse is incredibly efficient compared to a conventional demolition. “We can effectively reclaim up to 50% of the tonnage of a house that would have otherwise been discarded – including architectural detail, antique items, and good quality building material that you can’t find in houses today,” she explains. Caesandra Seawell and Rachel Mathews of Buffalo ReUse provides the five takeaways of deconstruction below. 1. Cities all over the US are beginning to realize the benefits of deconstruction. With the ability to recover so many valuable resources from a large stock of old houses, former boomtowns in the Rust Belt have seen the growth of green demolition/salvage social enterprises. “For example, in Pittsburgh there’s Construction Junction, in New York there’s Sustainable South Bronx, in Washington State there’s New Heights Construction, and in Baltimore there’s The Loading Dock. Similar programs have also popped up in Portland and Detroit,” explains Mathews. 2. Construction waste makes up about 20% of landfill waste in the US. Without so much of a thought, many old buildings are demolished, reduced to a pile of rubble, and a new building is plopped into its place. Debris is cleared away and dumped in a landfill. Plenty of this building material is valuable and recyclable, such as wood, metal, concrete, paper and plastic. 3. The economics of demolition differs from jurisdiction to jurisdiction. Seawell explains the costs of deconstruction versus demolition. “The average two-story house costs between twelve to sixteen thousand dollars to demolish, whether it’s regular demolition or deconstruction. This yields about 45 tons of rubble. However, with deconstruction, the difference is that the owner gets a tax deduction for donating the materials that are salvaged and recycled – this is usually around $8,000 or so,” she explains. “The cost of the deconstruction is based on a couple things – equipment rental, cost of throwing material in the landfill, whether or not there is asbestos in the building, sewing cuts and labour,” says Seawell. Prices also vary between counties. 4. Deconstruction is a great way to salvage a piece, or pieces, of history. Beyond the economic benefits of deconstruction, the simple fact exists that deconstruction yields some really cool stuff. Visiting ReSOURCE, I came across early 20th century door handles, 1950s light fixtures, stained glass windows, vases, paintings, chandeliers, sinks, and beautiful cabinets, copper ceiling tiles, and a bevy of other bric-a-brac. Most of these things were constructed during a time where quality was important, and planned obsolescence was not a standard. 5. Deconstruction is also a way to engage the community. Buffalo ReUse has found that deconstruction has had a number of knock-on effects. First, is that deconstruction has helped to remove abandoned houses, which are seen as liabilities in the city. The organization has also hired and trained local people, many of them youth from low income neighbourhoods. The store, ReSOURCE, has been able to sell low cost items for people in the neighbourhood. The organization has also engaged its neighbours in urban planning, envisioning how vacant spaces would take shape in their community. “Ideally, we want to transform all of the vacant lots in our target area into gardens, parks, safe pass-thrus, greenhouses, and other spaces that benefit and beautify the neighbourhood,” explains Seawell. “On top of that, we also want to continue to plant trees, hold workshops, empower the community, and promote environmental stewardship,” she adds. It is clear that Buffalo ReUse has some lofty goals and big ideas. Like their deconstructions, with a little elbow grease they can make these things happen. Thanks to Rachel Mathews and Caesandra Seawell in writing this article. More information about Buffalo ReUse can be found at http://www.buffaloreuse.org.